You may find it useful to have paper, ruler, compasses and scissors to try this task. How could you work out the area of a regular dodecagon? One way to find the area of shapes is to cut them up and reassemble them into shapes where the area is easier to calculate. Start by creating your dodecagon. You could use GeoGebra or construct it with a ruler and compasses. Click below to see some instructions for constructing a dodecagon, or watch the video. Start by drawing a fairly large circle - filling a sheet of A4 will be fine. Keeping your compasses at the same separation, mark off six points around the circle. Bisect one of the six arcs, and then use this distance to mark off the remaining six points. By cutting out and rearranging some of the pieces, can you create a shape made up of squares? 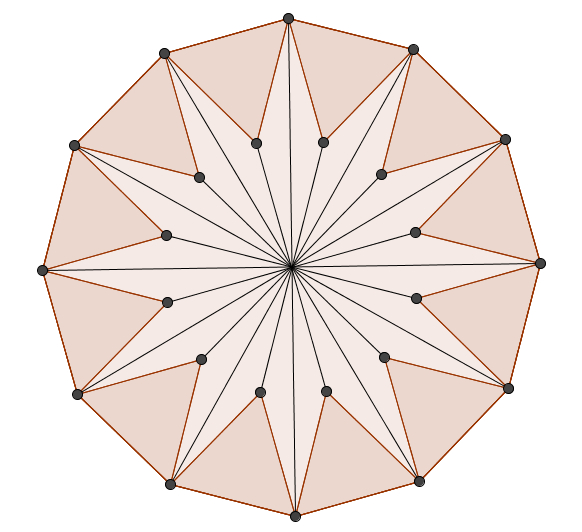 Can you use this dodecagon dissection to prove that the area of a regular dodecagon is $3r^2$, where $r$ is the radius of the circle passing through the vertices?